Considered the founders of Chicago, Catherine (1756 - 1809) and Jean Baptiste (1745 - 1818) Point du Sable established a fur trading post on this site in the 1770s or early 1780s, approximately a half century before Chicago was incorporated. 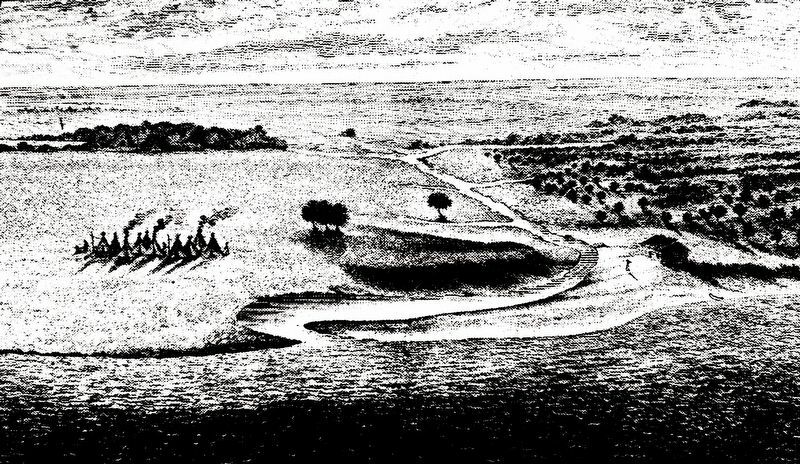 This commercial enterprise helped shape the American government's vision of the potential of this area and therefore its decision to build the first Fort Dearborn in 1803 across the river, at what is now the intersection of Michigan Avenue and Wacker Drive. a bake house, smokehouse, poultry house, stable, barn, 2 mules, 30 cattle, 38 hogs, and 44 hens. 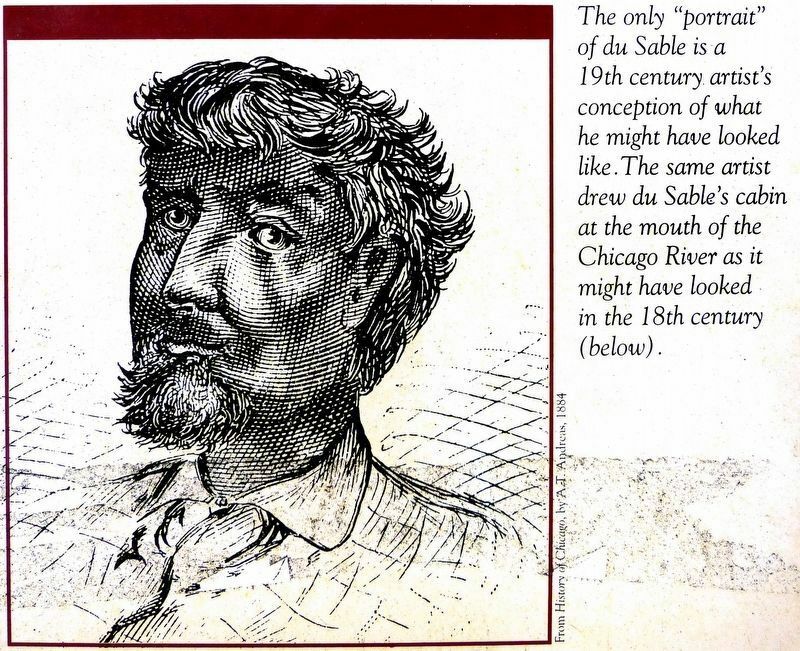 Du Sable's post, with its diverse clientele of Indian, French and American traders, established a tradition of commerce that would provide the foundation of Chicago's economy for decades to come. Chicago history rings with the names of men and women who have moved our city and nation forward — farmers, explorers, pioneers, traders; athletes, architects, workers, labor organizers, industrial giants, lawyers, teachers, inventors, writers, musicians, and artists. Chicago Tribute Markers of Distinction commemorate notable individuals who have lived in Chicago by marking the significant places where they lived or worked. Walking through the streets of Chicago, one can hear echoes of the past in Lawndale where Benny Goodman began playing clarinet before becoming the “King of Swing”, on the Near Westside, where immigrants were welcomed and assisted by the Women of Hull House, in pioneering architecture that rose from the ashes of the Great Fire of 1871. Chicago Tribute Markers articulate the connection between the city of today and the historic individuals and events that continue to shape our world. N, 87° 37.437′ W. Marker is in Chicago, Illinois, in Cook County. 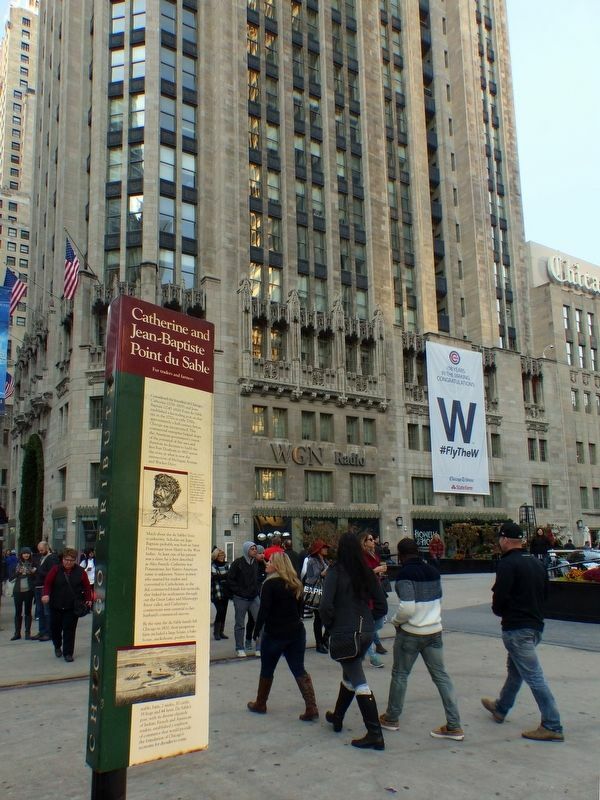 Marker is on North Michigan Avenue when traveling north. Touch for map. 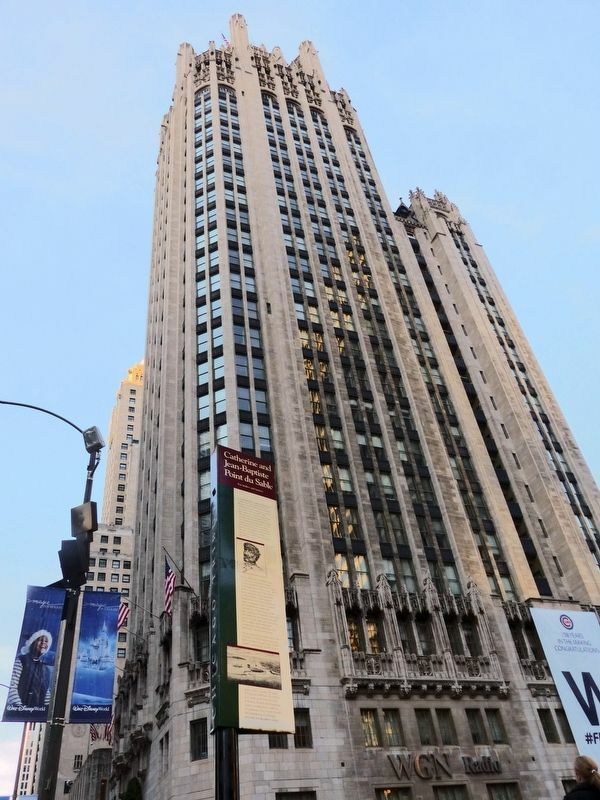 Marker is at or near this postal address: 419 North Michigan Avenue, Chicago IL 60611, United States of America. Touch for directions. Other nearby markers. At least 8 other markers are within walking distance of this marker. 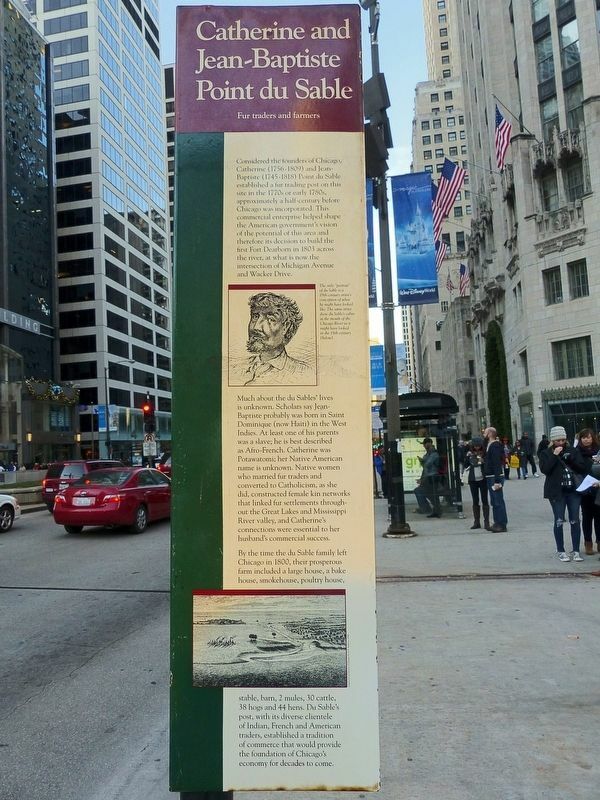 Jack Brickhouse (a few steps from this marker); Tribune Tower (within shouting distance of this marker); The Discoverers (about 300 feet away, measured in a direct line); Jean-Baptiste Pointe DuSable (about 300 feet away); The Pioneers (about 300 feet away); Louis Jolliet & Père Jacques Marquette (about 300 feet away); Green Bay Road (about 300 feet away); Regeneration (about 600 feet away). Touch for a list and map of all markers in Chicago. More. Search the internet for Catherine and Jean-Baptiste Point du Sable. Credits. This page was last revised on November 23, 2016. This page originally submitted on November 19, 2016, by Allen C. Browne of Silver Spring, Maryland. This page has been viewed 260 times since then and 20 times this year. Photos: 1, 2, 3, 4, 5. submitted on November 19, 2016, by Allen C. Browne of Silver Spring, Maryland. • Bill Pfingsten was the editor who published this page.